If you don't own a copy of this book, I suggest you find one, NOW!! :) Here is one of my favorite photos. 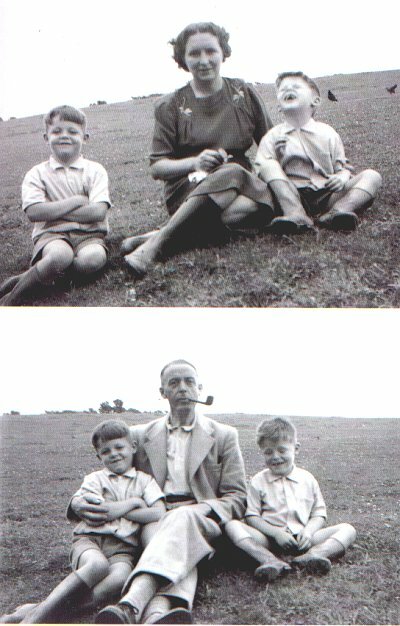 They may look like two sweethearts, but Mike tells us that his Uncle Joe said they were "two right little swine". The brothers are shown here in their little "cosies" or bathing costumes. Mike explains that they would get heavier and heavier as you went through the water and "eventually the bloody things came off". I think Paul has to use the potty or something though... :) The pictures below are also from the same book. 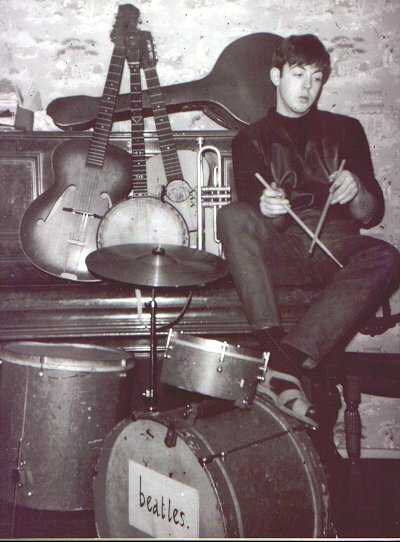 Paul with the drum set he "nicked" from brother Michael. The guitar on the right was his first, the banjo, his father's, and trumpet his first instrument. John and Paul rehearsing at the Cavern. Moody shot of Paul actually looking in at the outside toilet! This is the way he and brother Michael would ceome in late if they lost their keys.